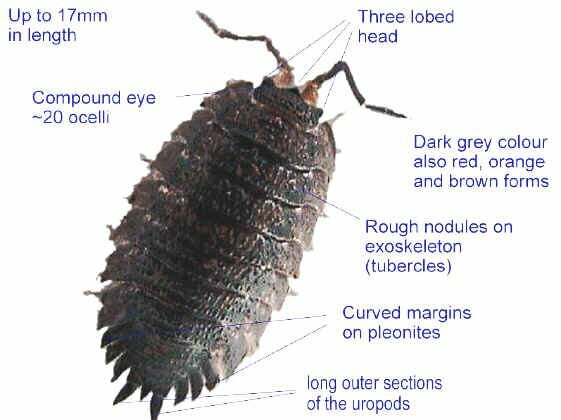 The features on the diagram and notes below may help you to identify if your woodlouse is a Porcellio scaber or some other species of woodlouse. P.scaber cannot roll into a ball. When it is disturbed it tends to quickly run away. There are two pairs of projections on the uropods although the inner pair are much smaller. The posterior end of the plates of the exoskelton (pereiopods and pleonites) tend to come to a sharp point rather than being rounded.